You want to register an internet promo with 30 days validity? Try out Globe GOCOMBOAHAF204 + GOCOMBOGKEA42. A GoSakto Prepaid promo that gives you up to 1-month internet access with total of 1GB data allocation. You’ll also have additional services of 1000 unlimited texts to all networks and 10 minutes of calling to Globe or TM mobile numbers. This is one best offer that you can subscribe if you’re a minimal data user who only uses the internet for important purpose. You can use it on to browse any websites like Facebook, Twitter and more, but I doubt your 1GB can go up to 30 days so it’s not advisable for a heavy data user. You can register via keyword format, just follow the correct format and reload your account with amount need to subscribe with GOCOMBOAHAF204. See mechanics below for your reference. If you want unli-call and text to all net, try Globe GOCOMBOIJHD95 promo for 7 days. 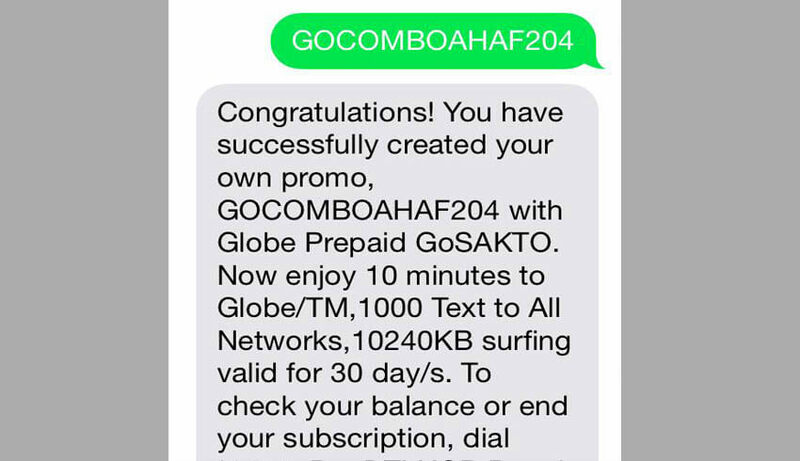 Here’s a tip, you can also add up more call, text and data if you register to another GoSakto promo like GOCOMBOGKEA42, add 42 pesos on top of the current promo. 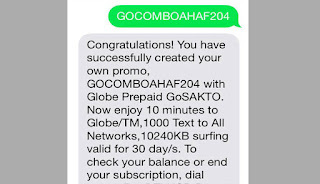 To check your promo status just text GOSAKTO STATUS to 8080.
is this trick still working? ?